Scotland have sorted the lineout to the level where it is a genuine threat rather than the possession drain it was, and the scrum is usually 50/50 against the teams we’ve played so far. But there are still some worrying basics that aren’t up to club level, let alone international. The current back three are massively ineffective under the high ball, regularly giving it away, knocking it forward or worse handing it to the opposition (Tommy Seymour is more reliable, but injured). On our own ball we could just stop kicking it, which would be incredibly sensible with the running threats we have. But teams are still going to target Stuart Hogg, Tim Visser and Sean Lamont with garryowens and if you have jumpers as good as Wales it’s a great way to improve territory. Never doubt the man’s heart – you can see it written on his face every time he plays for Scotland – but Greig Laidlaw is (again) dictating too slow a pace for Scotland. In the autumn the ball was swiftly away from the base, and Laidlaw offered an attacking threat. This week his two attempted runs were in the first ten minutes of the game. In both games he was crabbing sideways again and without extra time on the ball before the defence gets to him, Finn Russell’s game also suffers. It might just be that Laidlaw doesn’t suit the high-tempo game Vern Cotter is trying to get Scotland to play. Luckily there’s the confident and in-form Sam Hidalgo-Clyne waiting. He’s pacy, far more of an attacking threat, very handy off the tee and young enough that he’ll do what big Vern tells him to. It would mean finding a new captain; one who knows that taking the points on offer is not weakness, but a vote of confidence in your team to score next time too. The young fly half had a very mixed game. He was still an attacking threat and put a few well-timed passes in that unlocked the Welsh defence. On the other hand there were too many poor kicks and that “tackle” on Dan Biggar. He overhit a simple tactical kick early on, and more crucially missed two penalty kicks to touch gifting Wales lifelines when Scotland had just overcome a suffocating spell after the half and were back in the match. The card incident has since seen him cited to appear in front of a disciplinary panel. Any ban could also see a new fly-half required to face Italy in two weeks just as we have found our man. It could be a test of his happy go-lucky nature. We have to learn something positive, don’t we? Warren Gatland said that was the toughest Scotland team Wales had encountered in his tenure, so I suppose we’ll take that. Three points is thankfully, less than last years margin, so we’ll take that too. 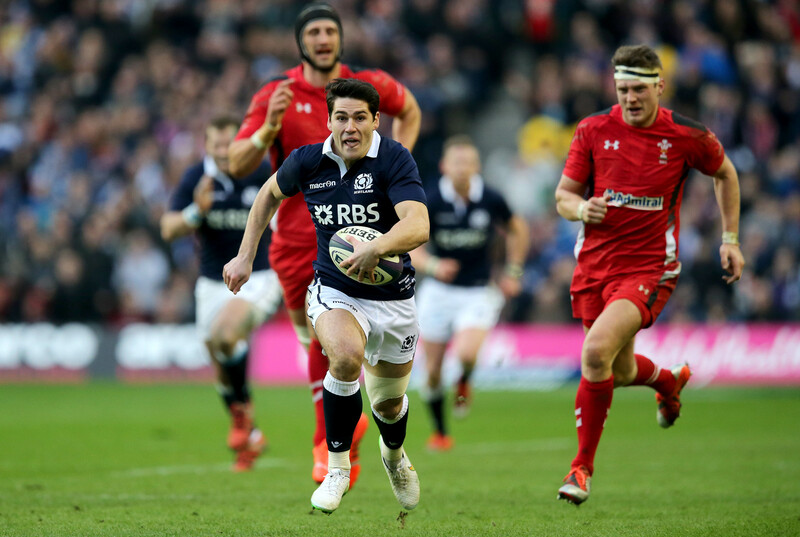 Alex Dunbar is rapidly becoming indispensable; his battle with Roberts was huge. You can see the class starting to emerge in the young ranks of this team with every game. As a nation of supporters, Scotland fans are really very much over the plucky losers thing though, having been a team in development for about, well, 15 years. A win against Italy must be delivered not for the safety of Cotter’s job (In Vern We Trust), but just for our sanity. I wasn’t going to mention some of referee Glen Jackson’s decisions, but then I spotted there were 5 seconds left on the clock… Okay, so the match clock quibbles were, in fact, dubious. Scotland did no help to their cause wasting time with a fracas and a lengthy kick preparation. For me, the main area of contention was his decision not to review either Laidlaw’s or Mark Bennett’s efforts at the end of each half. Neither were certain tries, but both were worth a look. 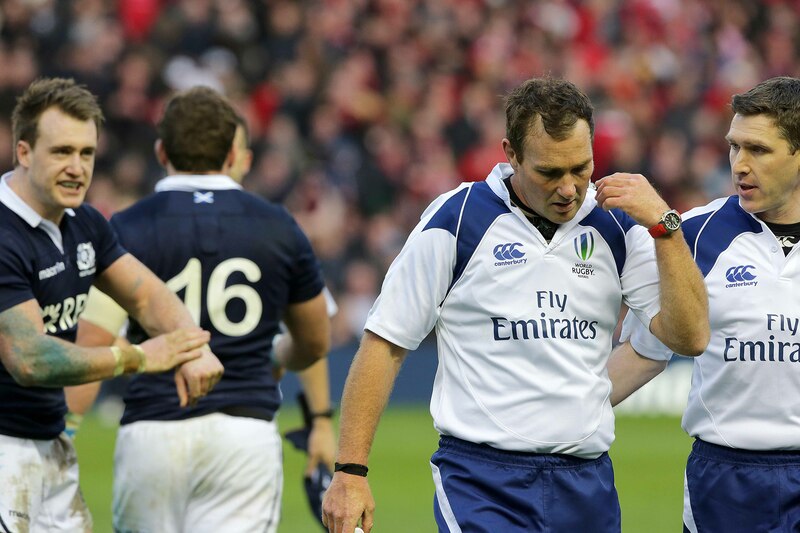 Having shown two cards first half, one of which was debateable (the Davies one), I feel he should have been keener to penalise blatant Welsh cynicism as they tried to shut Scotland out, not least the high tackle on Hidalgo-Clyne preventing a near certain try. There was also a dangerous shoulder barge on Hogg’s spine by Gethin Jenkins earlier in the game that may warrant further attention, but likely won’t. Still, I’ve never forgiven Jackson for keeping Gordon Ross out of the Saracens team when he was a player. We cannot blame the referee; Scotland blew more scoring chances to win the game than Jackson denied them. The March 2015 issue of Rugby World is packed with Six Nations features. Find out how to download it here and for the latest subscription offers click here.